Crafted by manufacturing and industry giant UCHIDA, and renowned for their superb workmanship, these handbells are the top-selling music bells in Japan. 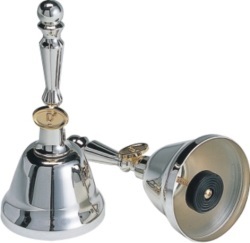 Additionally, the durability and popularity of the music bells have led to their implementation into numerous elementary music education programs in countries such as Japan, Singapore and Indonesia. Groth Music is pleased to be one of the first retailers to offer this affordable line of products to church groups, educators and performing groups looking for budget conscious quality.